There has been no shortage of injuries putting top players out of the FIBA World Cup in Spain this summer, but not all of them have been completely convincing for the fans. There is a growing feeling that some NBA stars have decided to put their domestic club career ahead of their international plans, and this has led to some of them dropping out, citing an injury and the need to rest up for the new season. 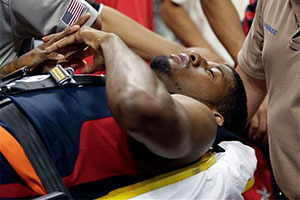 This is not the situation with Paul George as the Indiana Pacers star has suffered a horrific leg breaking injury yesterday. George was playing with international colleagues at the Team USA showcase on Friday but the exhibition game was soon to turn to a horror show. The game hadn’t even made it to the 10 minute mark when George suffered his accident. At this point, it appears that the player has done severe damage to his tibula and fibula although there is no confirmation of the severe nature of the injury. This of course will not stop some people speculating about the severity of his injury, and the potential impact it could have on George’s career, but medical experts have been quick to come out and say that players have bounced back from seemingly similar and even worse injuries and there is hope that George will be able to bounce back from this injury. Paul George was considered to be a key component of Team USA and this means that there will need to be a serious rejig of the American squad. 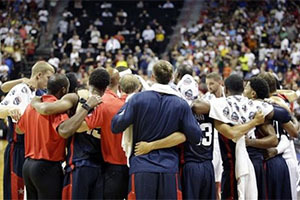 If you were thinking of placing a bet on Team USA at the FIBA World Cup but have concerns about the mental state the team is approaching the major event, this may be the time to find odds that are in your favour. This shouldn’t be the first thing you think of when a player has suffered a major injury but there is no getting away from the fact that a player availability shapes the likely nature of how a tournament pans out for a team. Without Paul George, Team USA will be missing a key member and there may be people starting to wonder how many omissions the roster can handle. The naming of the 12 man roster for the FIBA World Cup was scheduled to take place on Saturday the 2nd of August, but in the wake of the injury suffered by George, a decision has been made to delay the announcing of the squad. This clearly provides Mike Krzyzewski more time to formulate his reshuffled pack, but there is also a feeling that there is no need to detract attention away from Paul George at the moment, in what is clearly a difficult time for the player. There will also be plenty of Pacers fans feeling annoyed and angry at the loss of George, and this means that some fans of the National Basketball Association who have seen their top players pull out of this summer’s major event will be feeling slightly smug about life these days. You will also find that some of the players that have pulled out of the training camp may be thinking that this could have been them. However, when an injury to a key player comes along, there is always a chance for someone else to step in, which means that Team USA may unearth a new basketball star this summer.